Although s'mores are considered a summer camping treat by some, I don't think we ever stop looking for reasons to eat them in our house. And these adorable puffy cloud s'mores would be a fun treat for a rain shower themed baby shower or part of a rainbow party. Or just a fun snack to make with the kids when you are stuck inside on a rainy day. 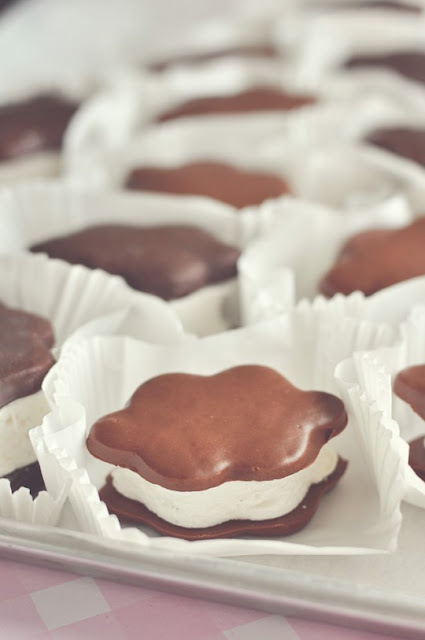 You can check out how to make puffy cloud s'mores over at Sweetapolita. These look so yummy- and pretty, too. Times like this, I REALLY wish I wasn't gluten-intolerant! But I could eat the marshmallows, wonder how they would be dipped in chocolate.